A winter shot of Mt. Faito with snow. The town of Castellammare is visible on the left at sea level. Sorrento is a few miles farther out the peninsula to the right. The photo is shot from Naples. The red building in the foreground is the Nunziatella military academy. Line-of-sight distance across the bay to Mt. Faito is about 15 miles (24 km). Mt. 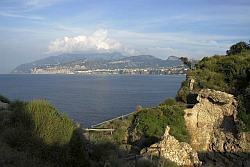 Vesuvius is out of sight to the left of the photo and only about half that distance from Naples. 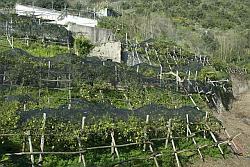 The mountains that form the backbone of the Sorrentine peninsula are called the Lattari mountains; they are bounded by the gulf of Naples on the western side and the gulf of Salerno on the east. 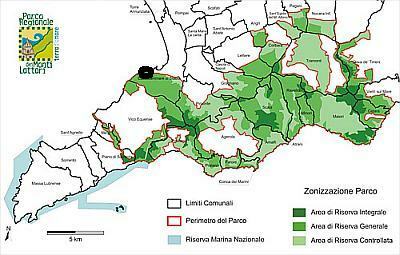 The Lattari are the western extension of the Picentine mountains of the Campanian Apennines. The name Lattari derives from the Latin lactis-"milk," in this case referring to the flocks of goats that grazed in the area. The name occurs quite often and prominently in history, the earliest and perhaps best-known occurrence being the Battle of Mons Lactarius in 553 AD, the battle that marked the final defeat of the Goths in Italy, ending the devastating Gothic wars. 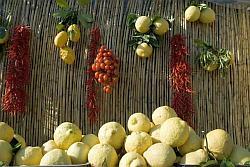 It took place on the slopes near the modern town of Lettere (same 'milk' etymology), a site that is well-visible from everywhere in the bay of Naples. That site is just north of the highest point in the Lattari chain, Mt. Faito. At an elevation of 1,131 meters (c. 3400 feet), Faito is just shy of nearby Mt. 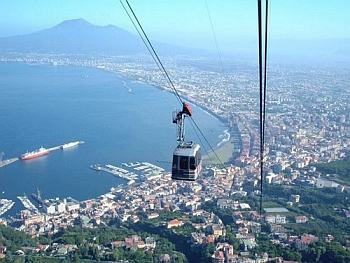 Vesuvius (1281 m./3843 feet). 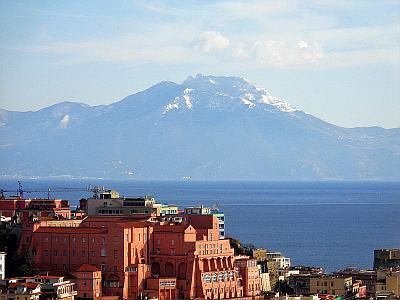 The other big difference is that Vesuvius is on a plain and is a volcano; Faito is not. The Lattari chain is pretty solid limestone, the result of tectonic upthrust ages ago. 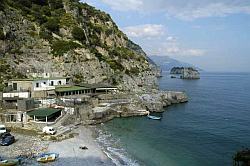 On both sides of the Lattari chain, there are steep cliffs dropping down to the sea. The name Faito comes from faggio (or faggeto), the beech tree. Some of the trees are said to be 400-hundred years old and have a diameter of six meters (18 feet). The park is the area bounded by red lines. Mt.Faito is the black dot. As indicated in the greeting mosaic at the Faito summit, Monte Faito is within the boundaries of the Regional Park of the Lattari Mountains. That park has existed since 2003; it covers some 160 sq. km (61 sq miles) and encompasses about half of the Sorrento-Amalfi peninsula (as far out as the town of Piano di Sorrento); it extends through the hills over to the waters of the Amalfi Coast on the gulf of Salerno and includes well-known tourist draws such as Positano, Amalfi and Ravello plus the many smaller seaside and hill communities, 27 towns in all. The park authority oversees an extensive network of well-marked hiking trails (photos below). All in all, it is an ambitiously large chunk of territory to protect especially since the ecology and considerable natural beauty are already burdened by pre-existing (before the park) stresses of overbuilding, especially along the coastline. 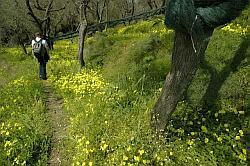 Monte Faito has much to offer but local sources lament that the area is getting short-changed in terms of regional monies that have so much else to do. There are fewer than 100 full-time residents at the summit community of Mt. Faito. It is true that some newer villas and hotels have sprung up, but there are many other things to be taken into consideration—getting up there, for one thing. The cabin-lift (photo, below) (built in 1952) has a long and notorious reputation of being on-again/off-again. (See update, below.) It is owned and operated by the Circumvesuviana railway and has often gone months of being out of service because of maintenance problems. Beyond that, the old Bourbon road that used to wind up from Castellammare at the bottom still does but is in terrible shape. There is a modern paved road, but it is often congested during the period when most tourists might like to tote some money up there and spend it. And so forth and so on. directly below. Mt. Vesuvius is in the background. Traditionally, the area on the way up to the summit was a target for pilgrims and hermits, and even today, you hear that this cave or that one was where this or that saint rested. I walked up and heard tell of a hermit that still lived up there. ( I didn't find him, so he must have heard me lumbering through the underbrush.) The very scenic cabin lift that goes to the top, leaving from the town of Castellammare, may be subject, as noted, to some restrictions. 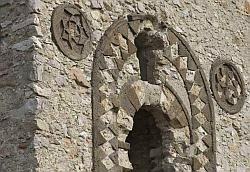 The town of Castellammare was the most important ship-building facility in the old kingdom of Naples and, indeed, owes its existence to the heavily wooded mountains above it. The abundance of wood suited to building ships is what impelled king Ferdinand of Naples to open the facility in 1783. (See this link for more on the tradition of ship building in Naples). The build-up of snow and ice at the higher elevations that lasted into the summer months also proved convenient for conserving foodstuffs. The mountain also serves the Italian Radio and Television network as an antenna site.